Make sure your business stands apart from the rest with our bold blue plastic merchandise bags. This size is a great choice for small to medium sized items like t-shirts and periodicals. 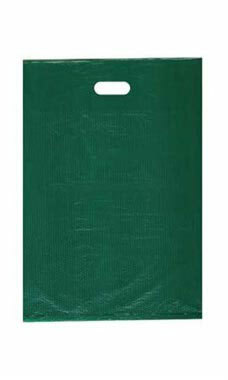 Our bags are a darker shade of green and slightly opaque. The bags are available in 5 sizes which allow them to be a great economic way to provide packaging solutions for all types of general merchandise and a great option to use during the Christmas holiday season.